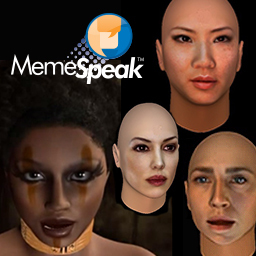 MemeSpeak Inc announces MemeSpeak™, a new cloud based social network tool that allows users to substitute talking head animations for textual blogging and messaging, in many languages for PC and mobile users on any social network or blog. MemeSpeak™ is a Cloud to Mobile web application that supports multiple language text inputs and natural language audio outputs in English, French, Spanish, German, Portuguese, Mandarin, Cantonese, Hindi, Hebrew, Vietnamese, Russian, Italian, Japanese, Korean, Indonesian, Arabic and Czech. Payments for subscription and Virtual Goods are at mobile APP price levels, are offered through the website, and currently supported globally through PayPal. Statistics on MemeSpeak animation views with GoogleAds show very high view rates – 30%-50% - for advertising, public announcements and news. Many ad animations can be created in minutes by any user, for any language, and distributed as small, fast playing video ads. The system can support hundreds of thousands of concurrent mobile or PC video clients and/or creators. Viewers do not need to be members of MemeSpeak™ to view the conversations on social networks or blogs. Any mobile platform with an internet browser can use the MemeSpeak™ system, and there are Android and IPhone APPs as "MemeSpeakTheAPP." Globally, the website will appear in multiple Unicode-supported languages. The system is automatically scaled on cloud networks to support 100,000's of concurrent viewers. The animations, created through text-to-speech on the MemeSpeak™ website, has most of the features of YouTube, allows users to create the animations and connect them through dynamic “learning” playlists of textual (and emotional) memes (which are automatically hash tagged) – then, they are distributed freely among friends or members of any existing social networks Facebook, Twitter, etc – only the textual links to the animations are distributed. (In fact, any social network can utilize generic avatar episodes or the novel MemeSpeak™ playlist pages can be embedded.) The meme tags are also searchable, unlike most blog commentary, through Google, etc. and evolve through SEO. The speaking animation links are can also be distributed as mobile messaging..e.g. WhatsAPP messages. The MemeSpeak™ system performs instant language transcoding from mobile and PCs text uploads and streams video animations to PC and mobile platforms (HTML5, Android, Windows, iPhone). The MemeSpeak™ system and animation creation contains novel algorithms for animation creation and multiuser support. MemeSpeak Inc products are available to service providers, entertainment broadcasters and corporations. http://www.memespeaker.com is the commercial website of MemeSpeak Inc.
MemeSpeak™ is a trademark owned by MemeSpeak Inc. The iPhone , Android, Windows Mobile, Google, Facebook, Twitter and related marks, images and symbols are the exclusive properties and trademarks of Apple, Microsoft, Google, Facebook and Twitter. All other brands, product names, company names, trademarks and service marks are the properties of their respective owners.